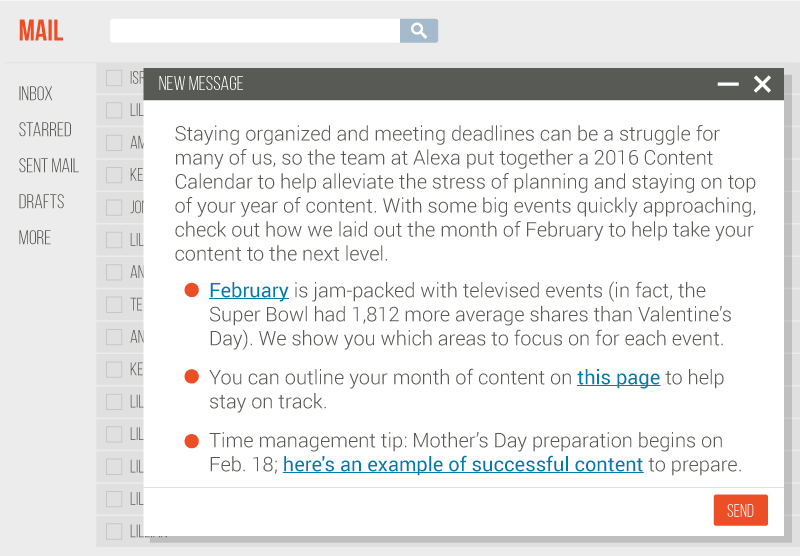 Our client, Alexa, came to us looking to increase awareness – not just around the Alexa name but also its resources. Many people had known Alexa as the site-ranking destination; however, Alexa also provides SEO tools that are invaluable to marketers. We knew it wouldn’t be enough to secure a lot of links for Alexa – we had to secure placements on marketing publications so the right people knew about Alexa and knew how Alexa could help them. Only this targeted awareness would help properly position Alexa within the industry. In this B2B content marketing case study, we’ll explore how getting high-quality backlinks is never a bad thing…but it’s not always the best thing either. It all depends on your goals. If they’re SEO-based, then yes, securing high-quality links is a sound strategy. But if you have other goals, such as lead generation, brand awareness, etc., then having a general strategy of just attaining as many links as possible is not going to be the most efficient. How did our Alexa campaigns receive coverage on all of the following websites during our four-campaign engagement? 1. We thoroughly researched what marketing publishers and audiences want. Based on our market research and on replies we were getting to our pitches, we identified that all content, no matter how new or groundbreaking, had to be actionable (that is, it had to provide tips that marketers could actually incorporate into their strategies). Through our research (and because we’re marketers ourselves), we know that the most beloved marketing content is content that suggest new tactics that allow you to make improvements to your marketing plan. You can’t ramble on about theory and leave it there – you have to explain why it matters and how marketers can implement the takeaways. 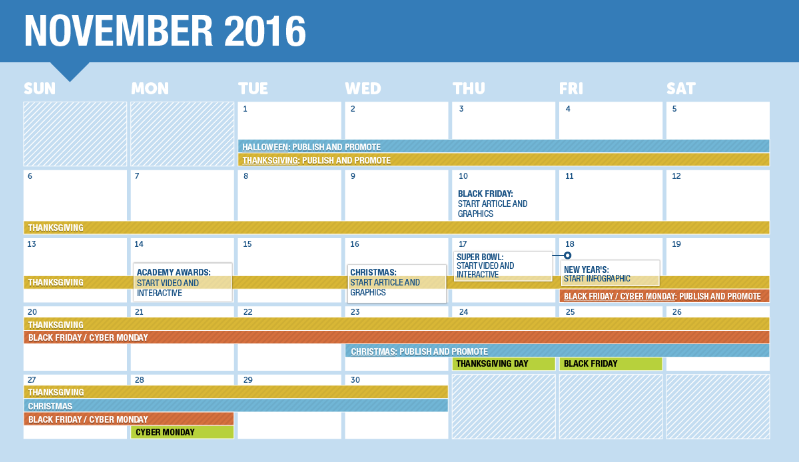 Our 2016 Content Calendar campaign is the perfect example of this, as its entire purpose is to help marketers know when to start conceptualizing, developing, and promoting content, which makes the content inherently actionable. As these replies demonstrate, marketing publishers want to post content that provides value to their readers. You’re in a much better position to get attention and coverage if you make that value clear to publishers in your pitches. 2. We used internal data to demonstrate authority and the potential of Alexa’s services. As a content strategy team, it’s vital to consider your data sources and what impact they’ll have on the way content is received. Using solely external sources, particularly in this case, would have been detrimental to our overall cause. Our goal is to increase awareness around Alexa being an integral part of a marketer’s SEO workflow, and if we created marketing/business content without ever incorporating insights gathered from Alexa’s tools, that would be like saying the tools are not necessary. We had access to a wonderful toolkit, so why wouldn’t we use it to kill two birds with one stone? We demonstrated Alexa’s value, while also doing new research and publishing new, helpful data that benefited marketers. 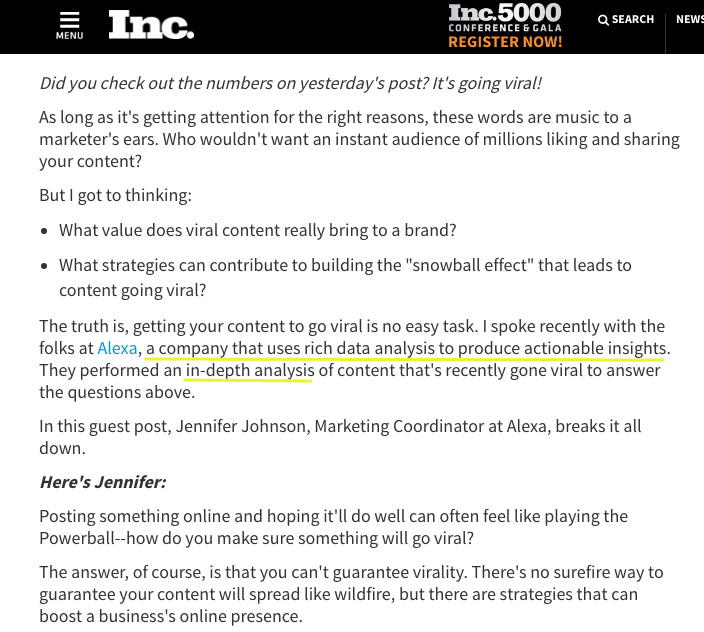 In the case of our Measuring the Effects of Virality project (featured in the Inc. post shown above), our creative team used Alexa’s tools to examine criteria. We looked at the number of social shares, page views, global traffic rank, traffic sources, etc. 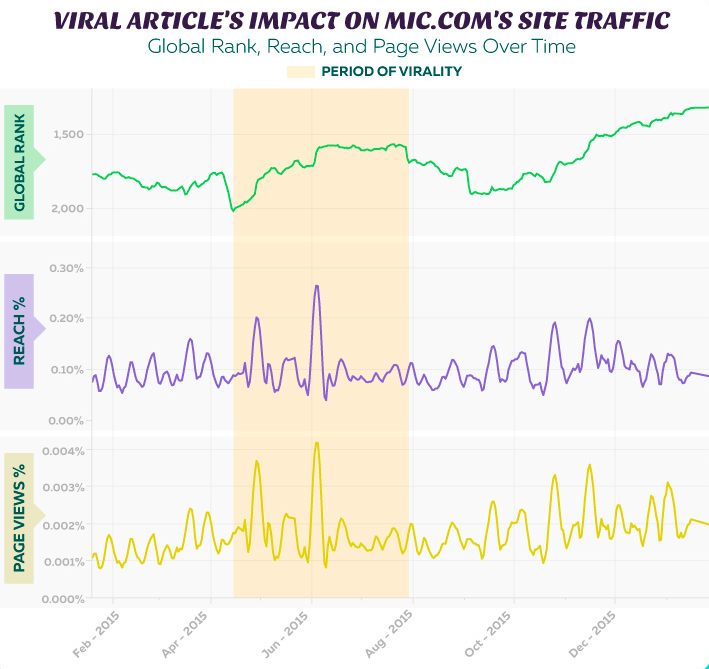 of four viral posts to discover the impact of their popularity on the sites hosting the content. For every B2B strategy, the Fractl team considers how to incorporate authority organically, which often leads to great placements that cite the client’s expertise. 3. Our promotions team adapted to the marketing industry’s unique requests. In general, when our promotions team starts its outreach, they’ll email writers and editors who they think would be a good fit for the content. If the writer or editor responds, they often ask for more information or say they’re going to do a write-up that incorporates our project. From there, the story is up to publishers – they pick and choose which visual assets they want to incorporate in their post, and they shape the narrative. What we discovered was that, in the marketing niche, clients preferred to feature other experts’ opinions in the form of guest posts rather than using our assets in a piece they were already working on. We had suspected this (as our Fractl marketing team often contributes guest columns to marketing publications), but we confirmed that guest posts were going to make up the majority of our outreach efforts after performing outreach for Alexa’s campaigns. 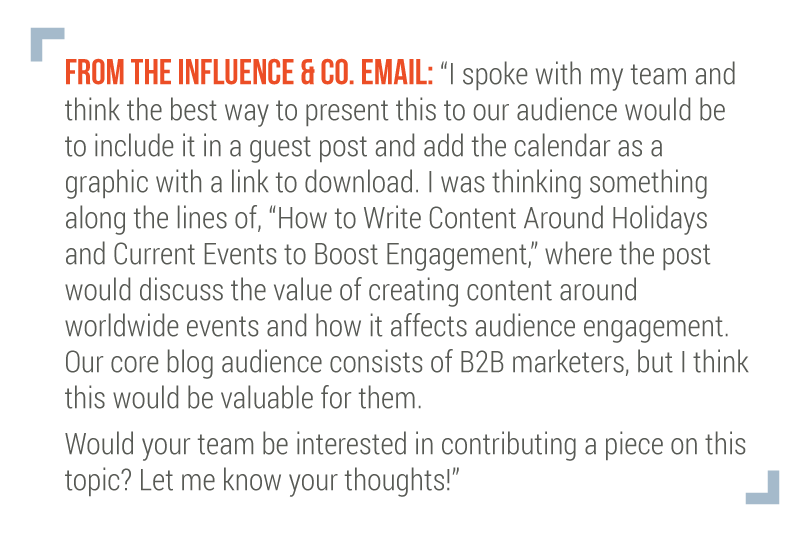 This key insight – along with our promotions team’s ability to be flexible and quickly alter our strategy – allowed us to start offering to write guest posts about the content. By paying attention to the preferences of publishers, we’re able to make posting the content much easier for them, which means they’re more likely to make the decision to run the content. The more steps you can eliminate between the pitch and the final “publish” button, the better. Thus, we worked with Alexa and secured guest posts that demonstrated the client’s expertise and explored particular angles of the project that had the most relevance to each publisher’s target audience. By quickly adapting our approach to outreach, we were able to feature Alexa on many well-respected marketing sites and blogs. All three of these steps are crucial to achieving B2B success in any niche. Without a thorough understanding of the content already available, a plan to position your client in a place of authority, and the capacity to alter your strategy on a moment’s notice, you risk missing out on top-tier placements and the recognition your brand deserves.